Compress you complete Project incl. PHP, HTML, JS, CSS & Images to one single self extracting PHP-File. Responsive with readme & licence file. No db needed! 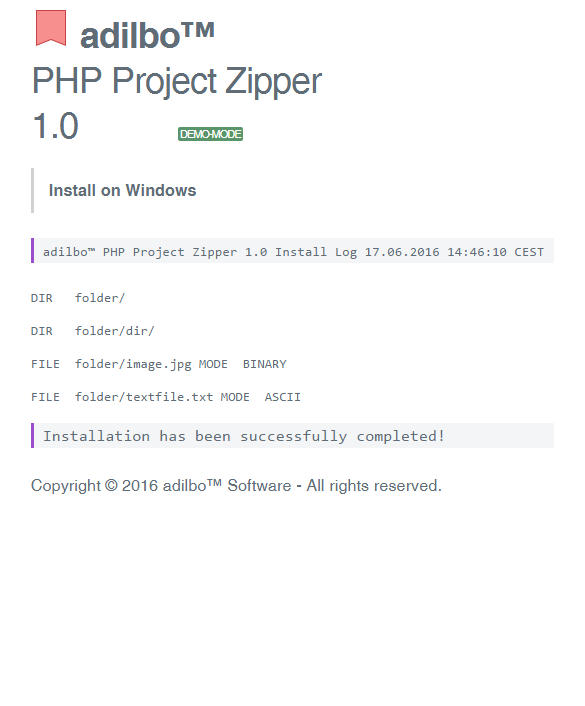 PHP Project Zipper is totaly new build up from scratch! 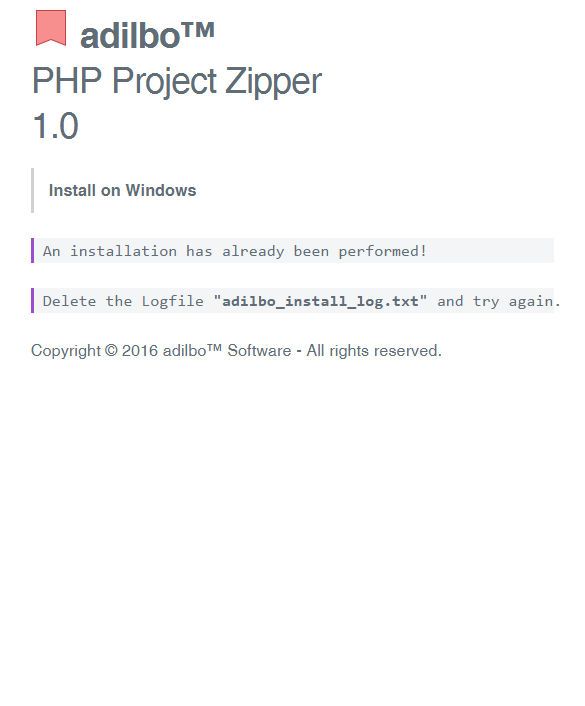 This tool is a complete solution to pack your application’s project files into the delivery package. The source code is packed and compressed to one file. all who need a lightweight utility to turn the project into the delivery package. The solution is oriented to the PHP applications, but can be used for the front-end projects too. There are many zippers around. Some commercial packer are very good, but rather expensive and may require system extensions. The others are limited with a single source type only. This packer is a handy integrated solution. 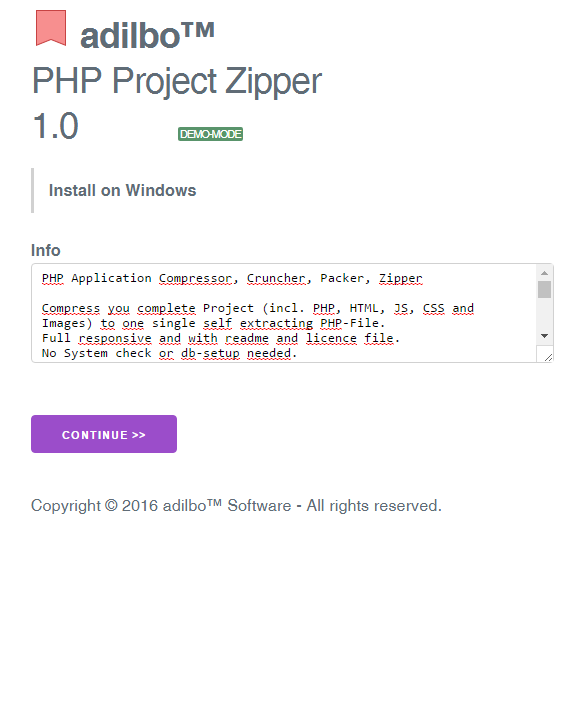 This tool takes a complete project with its php files, and compresses it in one result file. The source can be either a single file or folders which may have sub-folders. The destination is a packed and self extracting PHP file with the packed files. The html files that detected inside the project are packed too. The css and js are included for the embedded php to compress. The reverse engineering of the packed code before installation becomes difficult. than trivial applying of the base64_encode and eval. The php compression is supported by this special edition tool. There are no needet options to control the processing. Use them for specific cases and rely on defaults mostly. Launch the Packer via the WEB-UI or call the script directly over CLI. Short infos are returned about the processing results. You can display and/or save this data. 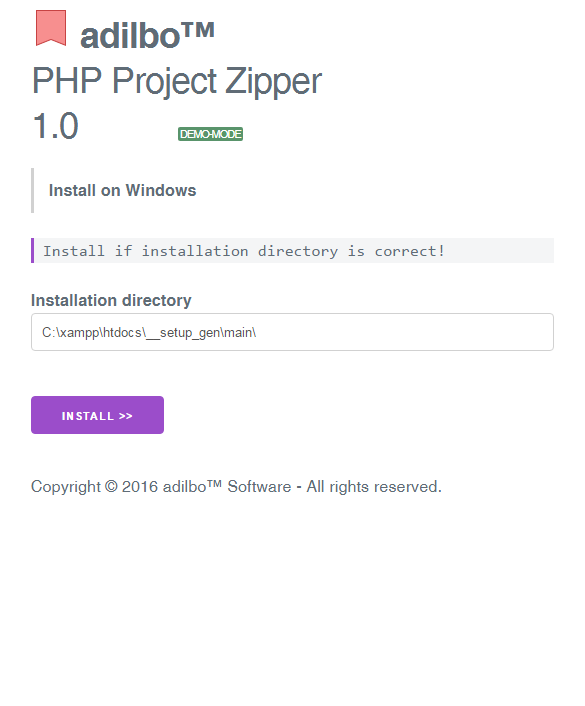 Unzip the obtained package and upload the files to your selected project web directory. from your project data and the lib (adilbo_lib.de) file. 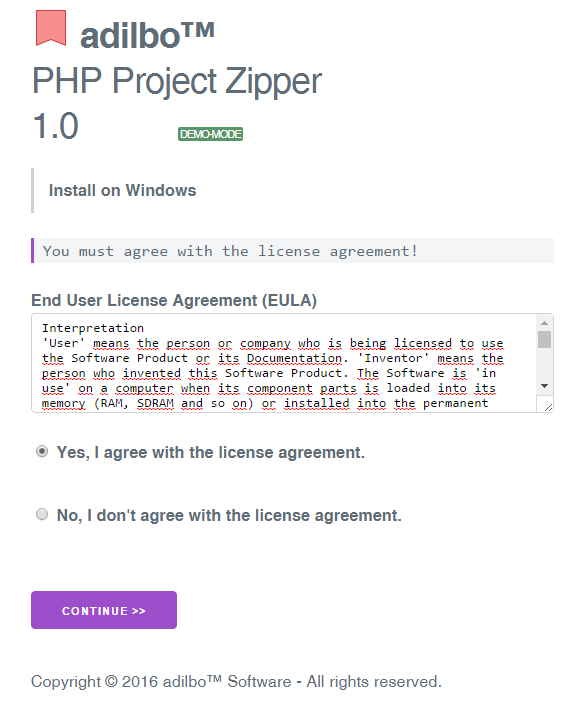 to launch the packed project installer directly. The statistics collected by the packer are displayed in debug mode and saved into adilbo_log.txt. 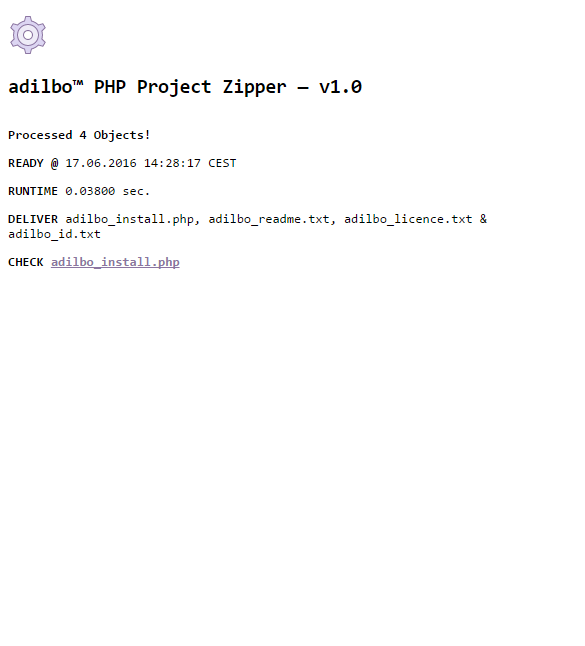 Try adilbo_zipper.php with different sources. 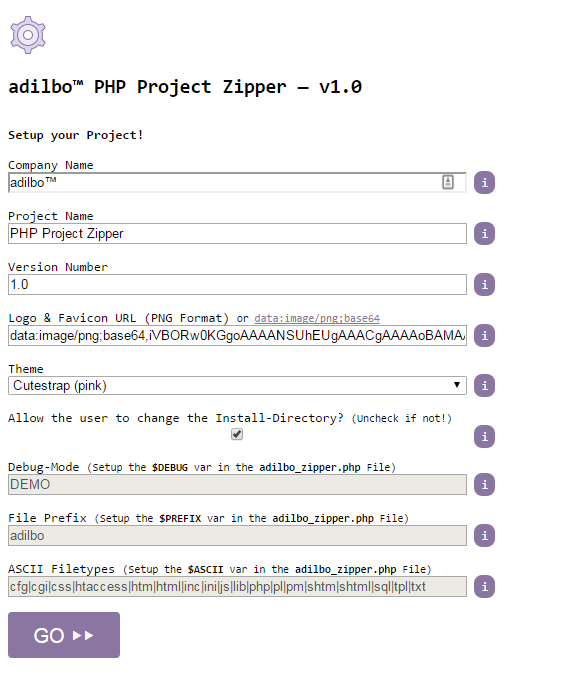 Run adilbo_install.php to launch the UI supplied by this zipper tool. It is very easy to use this. 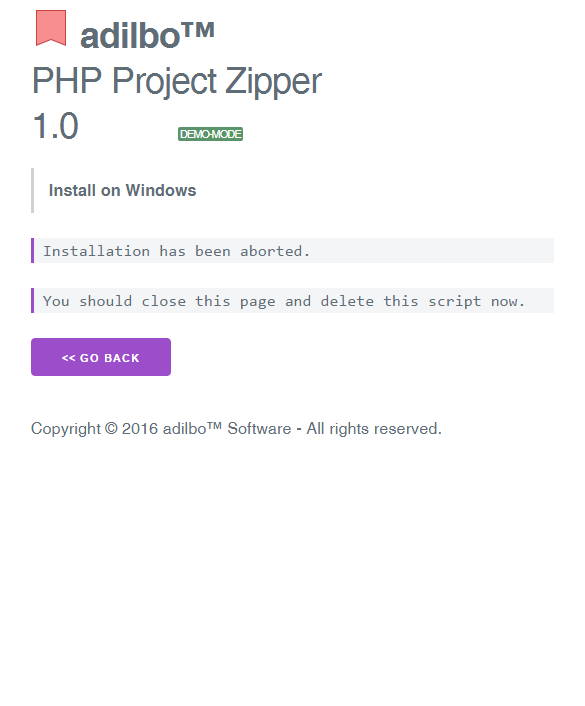 Simply copy 2-4 files to you Project-Directory, start one script and it will generate ONE self extracting PHP File from your complete Project. That’s it? You are ready to deliver it all in ONE File! !